COOK COUNTY,MINNESOTA – June 23, 2018 (LSN) In that last week, Cook County’s emergency services (including Law Enforcement, Search & Rescue Units, Emergency Medical Services, Volunteer Fire Departments and 911 Dispatch) have completed three challenging rescue operations across the County. The emergency calls highlighted departments skills and dedication to those they serve, to extract victims from some of the County’s most difficult terrain. On Sunday, June 17, at 10:32 am, a call came in indicating an adult female, visiting from out of town, was hiking with a walking stick at Cascade State Park when she lost her footing and slipped down over the edge of the river-side trail near the rapids. She then was carried over two of the river’s waterfalls before becoming stranded on a rock. In a joint operation with Cook County Sheriff’s Office, Lutsen Ropes Team, North Shore Ambulance, State Patrol and US Border Patrol on scene, responders were able to skillfully extract and rescue her from the river. She was sent to hospital to be assessed and released. At approximately 4 pm, Monday, June 18, a spot beacon locator assigned to an adult male confirmed to be on a five-six-day paddling trip in the Boundary Waters Canoe Wilderness area, was activated on North Temperance Lake. Cook County Sheriff’s Office Deputies and Search & Rescue (SAR) staged at the SAR unit garage located at the Law Enforcement Center to begin planning emergency water rescue operations. Permission for a Boundary Waters fly-over using Beaver Aircraft was requested from the US Forest Service Superior National Forest as well as authorization for on-the-ground responders to use motorized boats to get in to the remote location out of the Tofte SAR unit who staged at Brule Lake. At 5:13 pm, the USFS Beaver Aircraft was able to locate the red canoe and a man waving a paddle. A 61-year-old male, travelling with the 55-year-old male assigned the spot locator, was located and thought to potentially have a dislocated shoulder and arm/wrist injuries. At 6:11 pm, the Beaver Aircraft was re-routed to a priority call for an open fracture in St. Louis County and the party was instructed to wait at the site for SAR responders to extract them, ambulance and medics were staged at the landing near the west end of Brule Lake. At 7 pm, SAR was enroute on the water through a series of portages and at 9:33 pm, responders were able to transport the victim and party back through the series of portages. At 10:39 pm, the party was transported to North Shore Health Hospital. On Friday, June 22, a call came in at 12:48 pm, from International Emergency Response Coordination Center that a 14-year-old male had fallen and hit his head and had a seizure. The party was located at the southeast corner of Gaskin Lake. At 1:06 pm, Gunflint Ambulance and Gunflint Search & Rescue were paged, USFS Officer Belmore requested a Beaver Aircraft to land to pick-up the patient. Gunflint Search & Rescue stood by at Hall 1 as their response time would’ve been roughly two hours. At 1:50 pm, Cook County Ambulance was paged and enroute at 1:52 pm, and staged at the Devil Track Landing until the Beaver returned with the patient. The Beaver landed at Devil Track Landing to pick up paramedic and at 3:01 pm, the patient was on board. The Beaver landed on Devil Track at 3:36 pm, and the patient was transported to the Cook County North Shore Health Hospital, no further patient information is available. 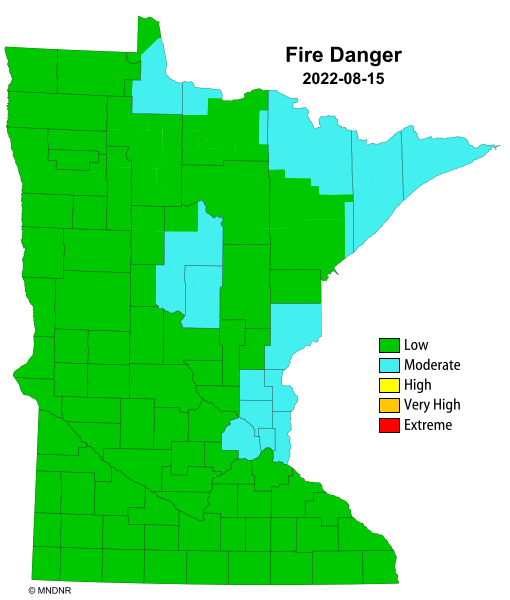 Second-largest county in MN by total area of 3,340 square miles (8,700 km2), of which 1,452 square miles is land and 1,887 square miles (57%) is water. Minnesota’s highest natural point, Eagle Mountain at 2,301 feet (701 m), and the highest lake in Minnesota, Lake Abita at 2,048 feet (624 m), both located in Cook County.